Talk Swedish to me, baby. NBC’s new summertime comedy plus, Welcome to Sweden, does so at length in most of its 10 episodes. The network sent all of them for review, and I kept watching until the supply was exhausted. The Swedish language turns out to be intoxicating, with English subtitles provided so that the gentle amusements won’t be lost in translation. Valkommen! 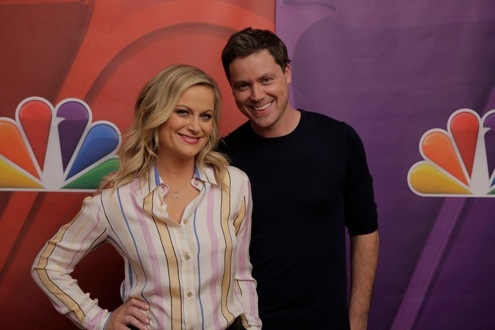 Greg Poehler, who in real life has lived in Sweden since 2006, joins his sister, Amy Poehler, as the show’s executive producer. A former lawyer, Poehler became a standup comic two years ago and is married to Sweden native Charlotta Poehler. For the purposes of Welcome to Sweden, Poehler is a dissatisfied, New York-based accountant to the stars named Bruce Evans. Weary of their constant demands, he relocates to Stockholm with new girlfriend Emma Wiik (Josephine Bornebusch). She’s a blonde beauty and he’s pretty much a nebbish. But that’s standard operating procedure in American sitcoms, except that it’s usually been a tubby guy landing the looker in series such as King of Queens, According to Jim and -- way back when -- The Honeymooners. Amy Poehler plays herself -- and a still possessive client of Bruce’s -- in Episodes 1, 3, 7, 9 and 10. Will Ferrell and Gene Simmons also drop in as Will Ferrell and Gene Simmons (Episodes 2 and 4 respectively) while Parks and Recreation co-star Aubrey Plaza is in multiple episodes as a neurotic, self-entitled stalker of Bruce. Abba member Bjorn Ulvaeus largely steals Episode 7, with a skeptical Bruce as his sounding board. Welcome to Sweden also accommodates Patrick Duffy and Illeana Douglas as Bruce’s off-putting parents. Seen briefly at the end of Episode 5, they come visiting in Episode 6. This doesn’t go very well, of course, and neither does this particular episode, which feels forced and derivative. The series usually is at its best when in the midst of Emma’s family. The still luminous Lena Olin is terrific as Emma’s bilingual mother, Viveka. Swedish otherwise is the language of choice for Emma’s tall, tradition-bound father, Birger (Claes Mansson). Her dense brother, Gustaf (Christopher Wagelin), and Uncle Bengt (Per Svensson) round out the featured homeland contingent. The latter owns a video store that does next to no business but makes him an encyclopedia of American actors and their roles. During their varied one-on-one discourses, Emma and her mother still talk in the native tongue. These are splendid scenes through and through. Plus you’ll get to improve your reading comprehension. “Cocktail,” says Bruce, somehow knowing this while not knowing who directed Taxi Driver. “Yes, please,” goes Gustaf. Welcome to Sweden is more charming and amusing than laugh-out-loud funny. But its charms are considerable and the overall premise is bracingly unique. NBC spent tons of time and money in the past season on heavily promoted, high profile sitcoms starring Michael J. Fox and Sean Hayes. Both turned out to be epic failures. If Welcome to Sweden doesn’t work, its failure won’t be epic. But during what used to be the throwaway summer season, this is a shining example of a comedy series that has a lot going for it in a smaller way.